Heidi and I have an older sister named Bethann. She’s well-known in the family for making really good appetizers! Now I am not sure where this Vidalia Onion Dip originally came from, but many years ago Bethann shared her version with me. Her recipe called for Swiss cheese. I’ve made it with just about every cheese imaginable. My favorite by far is cheddar. You can substitute your favorite! 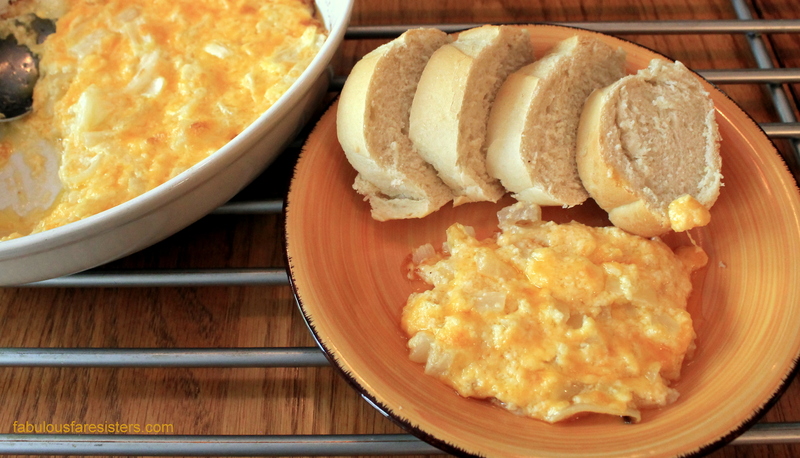 This dip is great served on sliced Italian bread or toast points or simple crackers…ENJOY! Heat oven to 400 degrees. In a medium bowl, mix the mayonnaise, cheese and diced onion* until combined. Spread into a baking dish and bake 20-25 minutes until lightly browned and bubbly! *Sometimes I saute the diced onions in a tablespoon of extra virgin olive oil in a skillet on medium heat for about twenty minutes to caramelize them. This adds a wonderful sweetness to the dip! Remove from heat and serve with sliced Italian bread or your favorite crackers. < Hands Down, Simply The Best Blue Cheese Dressing! This is right up my street for a bit of evening snacking! Have you tried it with any blue cheeses? Very easy. But do you think this can be done using a pan? Mouth watering as always Linda. Well done. I so love onion dip! Yum! Me too! This is my favorite go-to quickie appetizer…sometimes I’ll saute the onions before I add the mayo & cheese – it’s adds a depth of sweetness! I was thinking of sautéing them before baking too. Just a little browning would make them extra tasty! I must try soon!